Anthony Braxton regularly played standards — some of those efforts from the 1980s being quite abysmal — but a whole album dedicated to one jazz composer was unique (even if Braxton returned to that concept later). Six Monk’s Compositions (1987) is something of a doppelganger of Steve Lacy‘s Reflections: Steve Lacy Plays Thelonious Monk from almost three decades previous. Consider this: four of the six tracks here appeared on Lacy’s album, and both Mal Waldron (p) and Buell Neidlinger (b) played on both albums. Braxton is at his most approachable. He strikes a pleasant balance between faithfully playing these great songs and twisting things about just a bit in his solos. 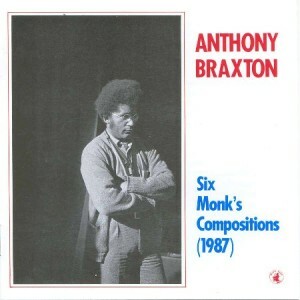 It helps that these are Monk‘s songs, where the winding melodies and jittery rhythms seem like a perfect fit for Braxton’s biting, intellectually playful style. This is a rather good Braxton release, and really must be one of his best “straight jazz” outings. “Reflections” and “Played Twice” are standouts.